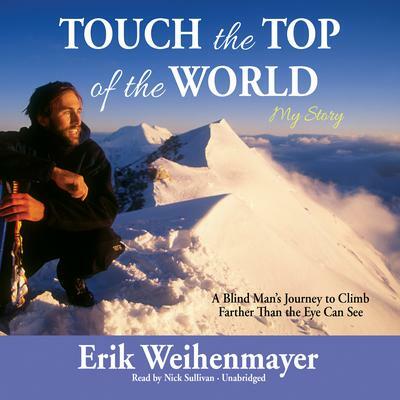 Erik Weihenmayer was born with retinoscheses, a degenerative eye disorder that would leave him blind by the age of thirteen. But Erik was determined to rise above this devastating disability and lead a fulfilling and exciting life. In this poignant and inspiring memoir, he shares his struggle to push past the limits imposed on him by his visual impairment—and by a seeing world. He speaks movingly of the role his family played in his battle to break through the barriers of blindness: the mother who prayed for the miracle that would restore her son’s sight and the father who encouraged him to strive for that distant mountaintop. And he tells the story of his dream to climb the world’s Seven Summits—and how he turned that dream into astonishing reality, something fewer than two hundred mountaineers have achieved. From the snow-capped summit of McKinley to the towering peaks of Aconcagua and Kilimanjaro to the ultimate challenge, Mount Everest, this is a story about daring to dream in the face of impossible odds. It is about finding the courage to reach for that ultimate summit and transform your life into something truly miraculous. Erik Weihenmayer was born with retinoscheses, a degenerative eye disorder that would leave him blind by the age of thirteen. But Erik was determined to rise above this devastating disability and lead a fulfilling and exciting life. In this poignant and inspiring memoir, he shares his struggle to push past the limits imposed on him by his visual impairment—and by a seeing world. He speaks movingly of the role his family played in his battle to break through the barriers of blindness: the mother who prayed for the miracle that would restore her son’s sight and the father who encouraged him to strive for that distant mountaintop. And he tells the story of his dream to climb the world’s Seven Summits—and how he turned that dream into astonishing reality, something fewer than two hundred mountaineers have achieved. From the snow-capped summit of McKinley to the towering peaks of Aconcagua and Kilimanjaro to the ultimate challenge, Mount Everest, this is a story about daring to dream in the face of impossible odds. It is about finding the courage to reach for that ultimate summit and transform your life into something truly miraculous.